From Nelson I reluctantly headed back to Wellington, cursing myself for not having an itinerary that continued south. However, Wellington will remain the most memorable city of this trip, although perhaps not entirely for the right reasons. The city markets itself under the slogan ‘Absolutely, Positively, Wellington’, which is sort of like working with somebody who constantly says “you don’t have to be mad to work here—but it helps!” before breaking into an annoying laugh. 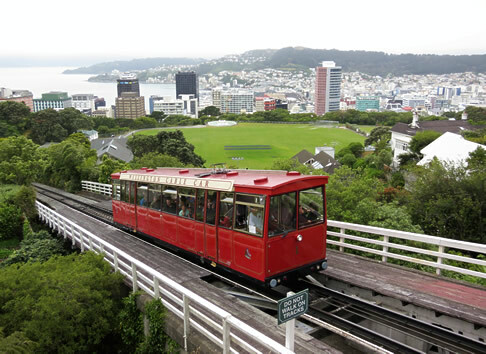 The Wellington Cable Car takes passengers from Lambton Quay in the CBD to the suburb of Kelburn, and the Wellington Botanic Garden. Much of this ‘madness’ can be attributed to the city’s architectural style, which could be described as eclectic at best. Other cities manage to curate a coherent cityscape, but in Wellington, anything goes. In fact it’s the most mediocre buildings that seem to gain prominence—the headquarters of the New Zealand Post immediately come to mind. The sleek black BNZ Centre, whilst a perfect example of the International Style that wouldn’t look out of place in Chicago, looks hideous here. But then so does every other building. However, if you look closely, you can still find a number of fine examples of the Art Deco style. The Prudential Assurance Building on Lambton Quay is one of few such buildings I spotted in the CBD, and there are many more in the surrounding districts (the Central Fire Station is a particularly beautiful example). The bohemian buildings along Cuba Street also have their own unique charm, as do some of the newer developments around the waterfront. So, not all bad. As you can tell, most of my time was consumed by the built environment, but I did take time to tour many of the city’s other attractions such as the Cable Car and Botanic Gardens. Of particular interest were the Parliament Buildings. Unsurprisingly this complex is comprised of three buildings built to very different and distinct architectural styles, yet unlike the rest of the city, they sit wonderfully well next to each other. The newest addition, and perhaps the most recognisable is ‘The Beehive’ (officially the Executive Wing), a modern cone shaped building with seven stepped levels designed by British architect Sir Basil Spence. Apparently its round shape causes great difficulty in terms of furnishing the building, but John Drawbridge’s mural in the Banquet Hall is a clever acceptance of this, with a canvas that adapts as you move along the room. 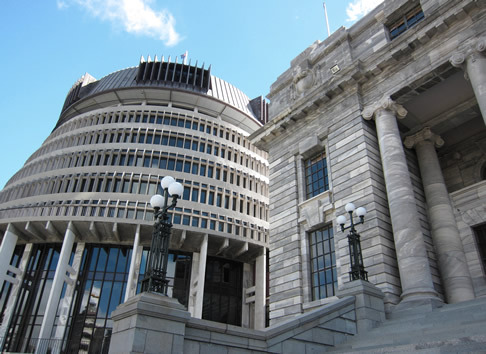 Attached to the Beehive is the imposing Parliament House, an Edwardian neo-classical building that houses the debating chambers of the House of Representatives and the Legislative Council, the upper chamber until it was abolished in 1951. The final building is the Victorian Gothic styled Parliamentary Library, that along with Parliament House seems to have burnt down on so many occasions I lost count. What I found most surprising about the Parliament buildings was the absence of any reference to the current monarch. The insignia of George V appears in a number of locations, but only as he was reigning during the construction of Parliament House. On asking the civil servant leading our tour why this might be, she pointed out the plaque commemorating the opening of the Executive Wing by Elizabeth II, and said I could ‘salute her there if I wished’. I suspect this was a taste of how the country views the monarchy, although understandable given its residence on the other side of the planet. Sadly, Wellington would be the last I would see of New Zealand on this trip, so after savouring my final Flat White at Wellington Airport (and hoping Australia would provide equally good coffee) I boarded my flight to Sydney. Having arranged my flights into and out of New Zealand before I had decided upon a full itinerary—departing from Wellington rather than an airport further south—meant I had little time to really explore the South Island. Before the tan disappears I’d like to record my short journey across New Zealand and Australia. There is much to say, so over the next few days, I shall try to describe how I ended the previous decade down-under. I’ve long held two ambitions. The first: to return to Australia before this decade is out. The second: to welcome in a New Year on Sydney Harbour before I turn 30.